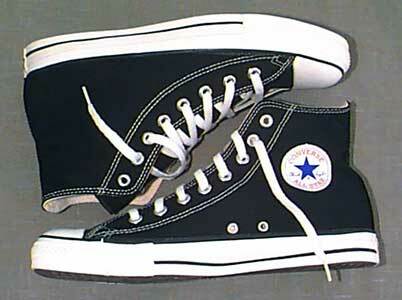 The iconic black and white Chuck Taylor All Star high top. They were the wings for the soaring dunks of Dr. J and were on the feet of Bill Russell and Larry Bird as they left tread marks across Boston Garden’s parquet floor. They gave extra jolt to Magic Johnson and “Showtime.” They were there for tennis stars Chris Evert’s and Jimmy Connors’ backhands at Wimbledon. And they were on stage for riffs by rock bands Led Zeppelin and Aerosmith. From the first pair that rolled off the assembly lines in 1908, to the first pair of All Stars worn by Chuck Taylor himself in 1917, to the “Weapons” donned by Magic and Bird in the 1980s, Converse was to the athletic shoe industry what James Naismith was to basketball: a revolutionary. At one time the shoe of choice by athletes, rockers and everyman alike, America’s original sneaker marks its 100th anniversary this year. It also celebrates a longevity that was unrivaled until a shift in the shoe industry in the late 1980s drove the company to the brink of extinction. Marquis Converse founded the company in Malden, Mass., in February 1908. The first shoes to roll off the Converse Rubber Shoe Company were galoshes. In 1917, the company created a simple rubber-soled basketball shoe wrapped in canvas. They called it the All Star. The first mass-produced basketball shoe in North America, the All Star didn’t catch on until the mid-1920s, when a Converse sales exec and company industrial league player named Chuck Taylor got involved. Taylor’s success promoting the brand at touring clinics prompted Converse to put his name on the shoe in 1932, and an icon was born. With more than 800 million pairs sold to date, it’s estimated that more than 60 percent of Americans own or have owned a pair of Chuck Taylor All Stars during their lifetime, said Hal Peterson, who has authored a book on chucks and runs a Web site called The ChucksConnection (chucksconnection.com). In his 49-year career, Blandini helped make shoes for some of the biggest names in sports and entertainment. In ads in newspapers and magazines, Converse declared “there is only one All Star” throughout the mid-’70s, and Magic and Bird asked people to “Choose your Weapons” in the famous 1986 campaign. Converse controlled 80 percent of the athletic shoe market at its height and its stock brought $28 per share in early 1997. A fateful decision led to a changing of the shoe guard. Michael Jordan came into the NBA hoping to sign a deal with Converse, which he’d worn throughout college. But Nike offered more money — what now seems like the paltry sum of $2.5 million, plus royalties, over five years. The Air Jordan franchise debuted in 1985 and as Jordan’s popularity soared in the 1990s, so did Nike. The All Star was finding new life as a counterculture shoe, but without an equally popular spokesperson, Converse had trouble competing. The brand fell behind Nike and adidas as those two waged war to stamp those brands into the minds of America’s basketball-playing youth. Another original running shoe, Reebok, made a charge in basketball with distribution capabilities that were on par with Nike’s, said Kirk Wakefield, professor of sports sponsorship and sales at Baylor University. “Converse lost its way when it didn’t shift as quickly as the industry.” Wakefield said. “It’s probably because they were originally more of a manufacturing company. They had that approach. Converse’s stock value fell to just 20 cents per share before it filed for bankruptcy in 2001. In 2007, the Jordan brand grossed about $800 million according to CNBC — just $100 million less than the entire company grossed when Nike originally signed him. Converse is now literally owned by Nike, which purchased the company for $305 million in 2003. Nike has left the Converse brand untouched for the most part and it has been resurgent in recent years. Profits reportedly rose to $205 million in 2003 and though Nike won’t release current figures, one of its chief executives told market analysts that Converse’s 2007 revenues increased 23 percent and are up 40 percent during the second quarter of 2008. The real appeal for Converse today is its retro coolness. “It’s still continuing to be popular as every new generation discovers them,” Peterson said. Converse Global Creative Director Scott Patt , who previously designed for Nike for eight years, said there will always be a place for Converse. “The industry changes, but our foundation and center around the originals and rebels who have chosen Converse as part of their lives within music, art, sports and fashion never changes,” he said. Converse enters its second century with athletes like the Miami Heat’s Dwyane Wade and rapper Common as spokesmen. Even if it might be a little much for the man behind the original Converse star. Worn exclusively by Julius “Dr. J” Erving and were on his feet during his infamous breakaway, windmill dunk and lunging reverse layup. Worn by then-University of North Carolina freshman Michael Jordan when he hit the game-winning jumper from the wing in the 1982 NCAA title game to beat Georgetown. Worn in epic basketball battles of Magic Johnson and Larry Bird in the late 1970s (college) and ’80s (NBA); the duo joined as Converse endorsers in the late ’80s for “The Weapon” campaign, named for the basketball shoe released in 1986 in many color schemes to match the kit colors of basketball teams. It’s been more than 40 years since Mike Blandini first stepped inside the original Converse Rubber Shoe Company in Malden, Mass., working the line for America’s original athletic shoe. Even though some details aren’t as sharp as they once were, the list of icons he personally helped make shoes for during his 49-year tenure still rolls off his tongue as a virtual who’s who of sports and entertainment. Blandini was one of Converse’s chief pattern-makers in research and development later in his career. In that role, he handled special makes for nearly all of the company’s top spokespeople of the day and got a free tour around the country that featured a front-row seat for the 1984 Olympics. Blandini also helped create models for field shoes, runners and baseball cleats. His products also made their way to several famous musicians. “Larry Bird, Magic [Johnson], [Kevin] McHale, Dr. J [Julius Erving] — all those big players,” Blandini said. “We also made quite a few [for] rock bands. Led Zeppelin, Aerosmith, U2, Pearl Jam . . . There were just so many. They used to come down to the facility to see how we made shoes for them. Special canvas All-Stars, knee highs, you name it. “I made shoes for them personally. I made casts of their feet and figured out where their problems were. Larry Bird had bone spurs on his Achilles’ tendon, and I had to accommodate for his pain. I had to make a special cast for him and figure out where the bone spurs were and accommodate for any pain. Blandini also made shoes for Converse’s chief tennis stars, Jimmy Connors and Chris Evert. The challenge of making Connors’ shoes, he said, was more logistical than anatomical. He also would log quite a few sky miles while accommodating Connors’ shoe needs. Another of Blandini’s favorite clients was Erving of ABA and NBA fame. Of all the stars he worked with, Blandini said Erving was the most personable. “We had to make 100 pairs a year for him,” Blandini said. “After every game, he would sign a shoe and give it away to a fan. . . . He was a true gentleman and the best guy ever. We got to be good friends. 1908: Marquis Mills Converse founds the Converse Rubber Shoe Company in Malden, Mass. 1915: Production of canvas footwear begins, offering year-round work to Converse employees. 1917: The world’s first performance basketball shoe, Converse All Star sneaker, comes off factory lines. 1921: Charles “Chuck” Taylor joins Converse with some ideas for All Star improvement, becomes what may be America’s first player-endorser, and publishes the first Converse Basketball Yearbook. A year later, he teaches his first basketball clinic at N.C. State. 1930s: Chuck Taylor’s signature is added to the All Star ankle patch, marking what has been referred to as the first-ever signature basketball shoe. 1939: First NCAA championship game held with both teams playing in Chuck Taylor All Star sneakers. 1942: Converse shifts production to support the war effort, designing the A6 Flying Boot — worn by the entire U.S. Army Air Corp — and Chuck Taylor All Star sneakers for basic training. 1949: Basketball Association of America and the National Basketball League merge to form the NBA. Virtually every player wears Chuck Taylor All Star sneakers. 1976: The Pro Leather shoe (above) comes to dominate professional basketball courts. 1984: Converse is official footwear sponsor of the Los Angeles Olympics; the U.S. Men’s basketball team wins gold while wearing Converse. 1986: Converse launches the “Choose Your Weapons” campaign. 1991: Converse launches “Grandma-Ma” campaign with Larry Johnson. 1992: The All Star celebrates its 75th anniversary, with 500 hundred million pairs sold globally. 2003: Converse is purchased by Nike Inc.
2005: Converse launches its first apparel line with Dwyane Wade, whose shoes are Converse’s first basketball signature line since the Chuck Taylor All Star debuted. 2008: Converse celebrates its 100th anniversary. Kyle Hightower’s Knights Notepad blog can be read at OrlandoSentinel.com/knightsnotepad, and he can be reached at khightower@orlandosentinel.com.